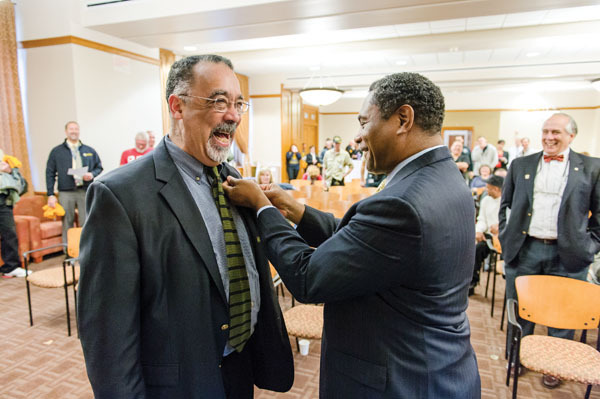 RANKING RECOGNITION: Vice President Paul Burgett ’68E, ’76E (PhD) receives a University pin in recognition of his service in the Army Reserves from Tony Kinslow, associate vice president for human resources, during a ceremony last fall. A retired lieutenant colonel in the U.S. Air Force Air National Guard, Kinslow established the annual ceremony to recognize faculty, students, and staff who have served in the armed forces. 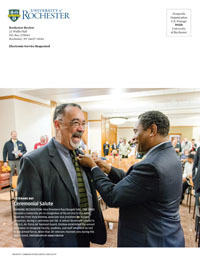 More than 30 veterans received pins during this year’s event.